On the fringe of London’s wealthy financial district, a four-storey building owned by one of the world’s largest companies has found an unlikely new purpose. 5-29 Sun Street, an office block owned by Swiss financial services giant UBS, was ‘repossessed’ last month by protesters part of the anti-corporate greed Occupy movement. Offering the opportunity to “trade in creativity rather than cash,” it is now bustling with art workshops and discussion groups focusing on everything from squatters’ rights to economic trade policy. The protesters did not pick their target at random. UBS has in recent years attracted heavy criticism for a range of risky financial practices. In 2008 the firm was made to pay a £500m fine to the US government over allegations it had helped wealthy Americans evade taxes through offshore accounts. The same year it reported losses larger than any company in Swiss history and, despite this, went on to pay some of its executives salaries of over £8m – slashing 11,000 jobs and accepting a £40bn bailout from the Swiss government along the way. 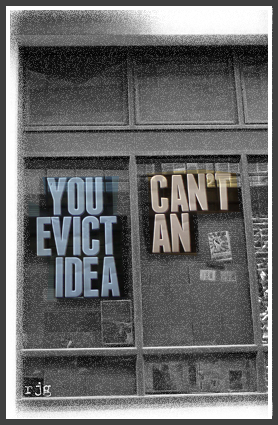 Renamed by protesters the Bank of Ideas, UBS’s multi-million pound London property has become an important hub for Occupy activists. As the winter weather begins to bite, their divisive outdoor campsite at St Paul’s Cathedral has seen a drop in numbers and is planning to scale down. The repossessed building, though run down, provides shelter out of the wind and rain, with toilet facilities, electricity and a kitchen serving up free hot food. Eviction proceedings have been launched against them, but the latest hearing was last week postponed until January. In the meantime, the Bank of Ideas is staying open for business. Inside the massive, 400-room building, people from all walks of life mingle. An open door policy is essentially in operation; all visitors must sign in, but anyone can come and go provided they are not disruptive. Among die-hard protesters who have been involved with the Occupy London protests since they began in October, there are homeless people, families, teenagers with nowhere else to go, and even a few inquisitive pensioners. Crammed with meeting rooms, a makeshift internet cafe, a library, a kitchen and even a 500 seat lecture theatre, it is in effect the largest community centre in England – albeit unofficially. On the first floor, down a quiet corridor, a large, bright room has been transformed into an art workshop. The walls are decorated with paintings and graffiti, and in the middle two young rappers, Sonny Green, 17, and Tom Coffey, 21, perform an impromptu song. Green, from Southend in Essex, explains that he stayed for two weeks the St Paul’s campsite, and has been visiting the Bank of Ideas since it opened on 19 November. A number of youth centres across London have been forced to close in the wake of recent government budget cuts, which has had a tangible impact on the lives of many young people in the city. The Bank of Ideas, though under-resourced and run by a ramshackle team of volunteers, is to this end performing an important function. Today, Green, who plans to release an album called When Words Fail Music Speaks early next year, has brought his friend and fellow musician Coffey to the Bank of Ideas for the first time. A rising star on London’s hip-hop circuit under the name “Agrow”, Coffey is impressed by what he has seen. Outside the art workshop, the rest of the office block is lively with activity. A large group gathers near the kitchen for a discussion on squatting, while up a flight of stairs in a calm room designated for meditation, a green-haired woman in her early 60s, Corina Flamma, shares an extraordinary story. Born in Liberia, she came to England in the 1950s as a child with her father, who was then the West African nation’s consul general to the UK. Aged 20, she sang in an all-girl pop group, the Flamma-Sherman Sisters, who secured a publishing deal with the Beatles’ Apple Records in the late 1960s. Earlier this year, Flamma was made homeless after her North London flat was repossessed. She now lives at the Bank of Ideas along with her daughter, Zo, on a mattress in a disused meeting room. There are many in the building, like Flamma, who face difficult circumstances. Yet despite this, a sense of optimism prevails. With an average of around eight workshops every day on a wide array of topics, there are opportunities to learn, discuss, share and build. This process has led the participants to feel they are part of a something positive and important – a global protest community that has flourished in 2011 and continues to grow. 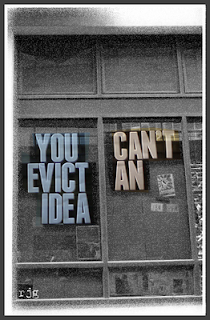 A court hearing to evict the protesters from the UBS building was due to take place last week, but was postponed by judges until 11 January, allowing the Bank of Ideas to keep its doors open over Christmas and into the New Year. A UBS spokesperson said: "We take note of the decision of the court [to delay proceedings] which we are now considering." The Occupy London protest movement has gained the support of a wide variety of public figures since it began in October. Musicians including Thom Yorke of Radiohead and folk-singer Billy Bragg have attended the Bank of Ideas in the last month, while renowned US civil rights activist Jesse Jackson delivered a speech outside the campsite at St Paul’s Cathedral on 15 December. This article first appeared in issue no.908 of The Big Issue in the North.